Nothing says adorable like a classic garden gnome. 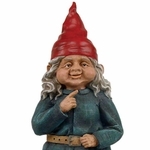 GardenFun’s selection of red hat gnomes is a warm way to welcome guests into your home or yard. 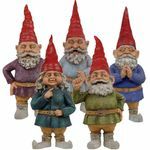 We carry a range of male and female classic gnomes including popular characters like Mordecai, Rumple, Zelda and Merlin. Choose from 8.5, 13, 15, 20, and 32 inch characters to fit your indoor and outdoor spaces. For serious gnome-aholics, purchase a set of five or six Toad Hollow gnomes to ensure that your home is completely decked out in gnome decor! Our 8.5-inch set of six Toad Hollow gnomes are perfect to place in small nooks and crannies, such as on the corner of your desk to spice up your workday. Your coworkers will love our gnome’s friendly faces. 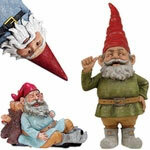 Our multi-gnome sets are also an ideal addition to your garden. 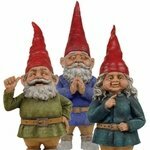 Your guests will enjoy finding each one of these traditional gnomes as they walk through your yard. Our girl gnomes include Lotie and Zelda figures dressed in orange and blue. 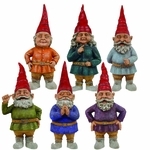 These popular girl gnomes are available in different sizes to fit any space. 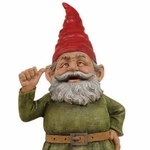 Add a smaller gnome to a corner in your home or garden for a special and friendly surprise. Each of our traditional garden gnomes feature hand-painted details that give their faces that realistic look that our customers adore. Their twinkling eyes and round cheeks are just charming. To showcase your collection, purchase a 32-inch large garden gnome. These taller-than-average statues are awesome centerpieces for your flower bed. Try a sitting gnome for an extra cute touch. These statues include snoring Grimmbel and Merlin styles that you can nestle against a tree or within your flowerbed. 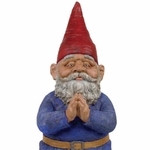 Our 13-inch sitter gnomes are designed to fit on your fence or another flat surface in your yard or inside your home. Our larger gnome sleeping on Toad House is 8 inches tall, 14 inches long and 8 inches wide. This item will look great near your front door or near your other snoring gnome statues. Passerby will appreciate each of our traditional garden gnome’s intricate detailing and lifelike look. 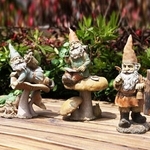 Find classic gnomes for your home or outdoor space at GardenFun.